Product #17174 | SKU SBE15 | 0.0 (no ratings yet) Thanks for your rating! Impact Sandbags come in a variety of shapes and weights. They are used for securing the bases of light stands and set walls. 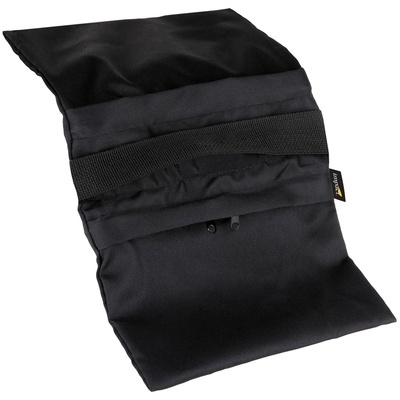 This Impact Empty Saddle Sandbag (Black) has two wings to allow draping over light stand legs. Each side of the bag has a hand strap for easy handling and hanging on hooks. This is an empty sandbag, with a double zippered closure. Fill it with sand or other available heavy objects upon arrival at location and empty it at the end of the shoot. Outer shell is water resistant, heavy duty cordura nylon, inner shell is polypropylene. Handles on both sides are heavy duty polypropylene with a military style box and cross stitch for extra strength.